Here is a recipe for a rrradical game design & literacy workshop I had the chance to organize together with Una Lee, Toronto-based activist, designer and all-around awesome person. It was presented at the Allied Media Conference in Detroit in June 2012 but you can try it at home, with your own class, club, organization or anywhere, really. In short, it involved remixing gameplays and cardboard sprites from classic arcade games in response to a pressing social issue or a real world scenario. At the Allied Media Conference, media creation is not only about personal expression, but about transformation – of ourselves and the structures of power around us. 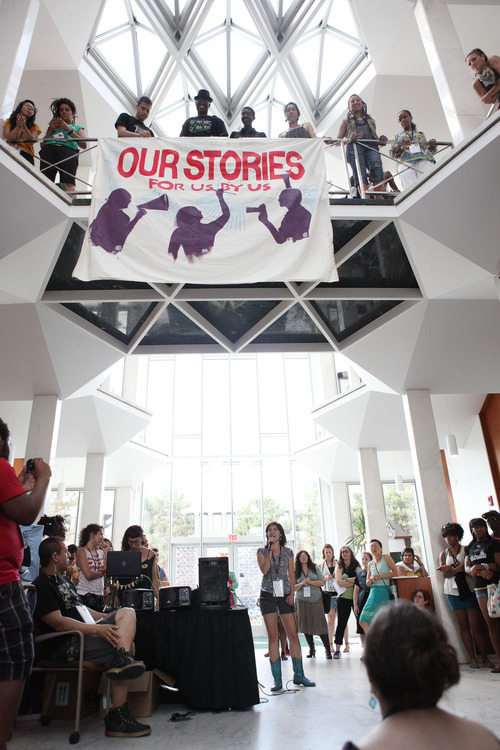 We create media that exposes, investigates, resists, heals, builds confidence and radical hope, incites dialogue and debate. We demystify technology, not only learning how to use it, but how to take it apart, fix it and build our own. Starting from this year the AMC included a section about games called “Imagining better futures through play” coordinated by Una and Cayden Mak, brilliant SUNY-Buffalo game scholar. 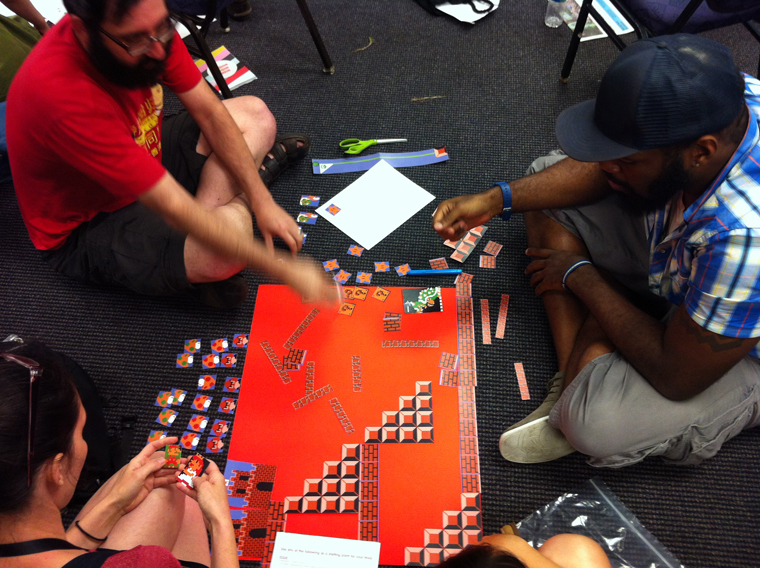 Our workshop, awkwardly titled “Designing revolutionary games with verbs” was part of it. The big challenge was to propose an exercise that could be executed in an hour and a half, by any number of people, of all ages, of any level of game and computer literacy, assuming no equipment at all. 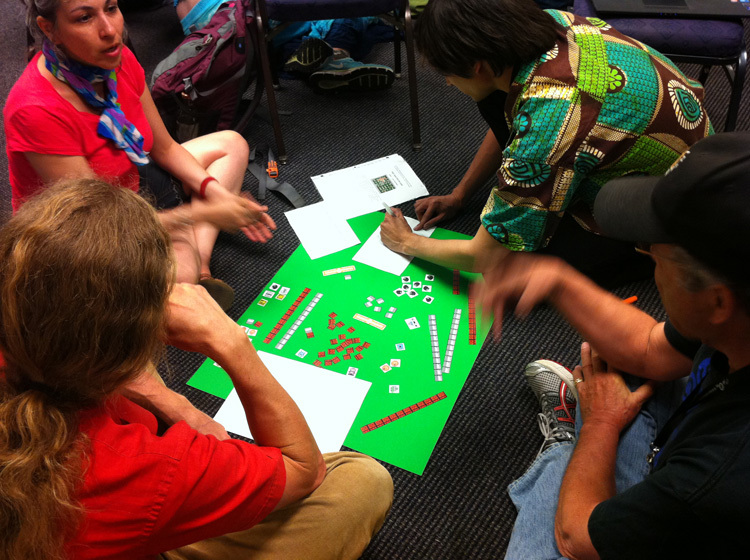 The main inspirations for the workshop were Grow-A-Game, a card deck by Tiltfactor and the research Videogames of the Oppressed projects by Gonzalo Frasca. We basically adapted these projects for a more socially-conscious and (potentially) less game-literate crowd. We opted for a quick paper prototyping activity, to take the technological aspects out of the equation and to provide a fun, physical tool to brainstorm in small groups. They are way more simple, with few elements and transparent mechanics. Many people are familiar with them or they can easily figure out the gameplay by watching a video playthrough. They help to conceptualize games as something more general and diverse than the contemporary dominant genre: a 3D space to be explored by an avatar, peppered by fragments of a story, puzzles and enemies. They are 2D, and that helps a lot when you are working on paper. They are, into some extent, game archetypes. They introduced some of the most basic elements that are still present in contemporary videogames (shooting and avoiding in Space invaders, Maze exploration in PacMan etc…). The second creative constraint was a randomly assigned “problem” card that represented an abstract social issue and a more concrete scenario. We thought it was important to describe issues as tensions and not only as negative or positive values to stimulate a variety of approach. Games can represent a problem, envision a solution, embody an interpersonal dynamic that resonates with the scenario and so on. The scenario is meant to be an example. Participants were able to choose to approach the problem in an abstract way (e.g. Economic Inequality) or in more geographically or historically specific way (e.g. the Downsizing of Detroit along class and racial lines) or anything in between. We provided each group with a collection of sprites ripped from the randomly assigned game, printed on cardstock, and pre-cut. The sprites represented the main movable visual modules; for levels and backgrounds we recommended to use markers on big cardboard sheets. We found that the physical paper pieces compelled participants to reason in visual and spatial terms and, at the same time, allowed a more democratic process since all members of the group (3-4 people) were able to rearrange elements as if they were working on a jigsaw puzzle. Providing visual elements to start from also discouraged the simple re-skinning approach, namely: changing stories and characters while keeping the mechanics intact. We didn’t have the time to test it but it may be fun to allow groups to trade elements and incorporate sprites from different games in the same design. Unfortunately we were too busy to properly document the prototypes but Una did a write-up of a dry-run of the workshop in Toronto. Read it here. If you are interested in proposing a game-related activity for next year’s AMC contact Cayden, Una or me. It’s going to be a blast!